Are you ready to start living a life of infinite possibilities? Dive deeper with Amir’s teachings in the OMG, 12-month coaching program. 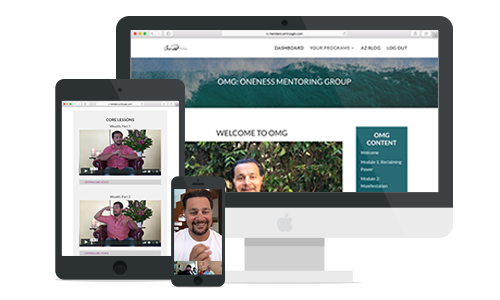 Each month you’ll receive access to videos covering a new topic and have live coaching calls with Amir and optionally an OMG mentor to help you implement the teachings. This powerful module breaks down what it really means to reclaim power. You will learn exactly how and why you put power into things and how this impacts your day to day experience. We will dissect the process of reclaiming power and how you can implement it into your daily life to experience greater freedom. In this module you’ll discover the truth about the often misunderstood topic of manifestation. This module breaks down the exact process of manifestation and how you really manifest in your life. We’ll cover the truth about WHO is actually manifesting in your life, through to how you allow manifestations to take form. This is some of the most advanced training on manifestation every released – enjoy! What is the ego? Who is the ego? What is the ego really looking for? And, how do you know when you are in ego? This module will answer your questions about the ego. You will learn how the ego plays its roll and how it continuously gives your power to the external. It’s only when you become aware of when you are in ego that you can begin reclaiming power from the external. Whether you realise it or not, everything in this world is about LOVE. Everything you do, everything you are searching for, every agenda, it’s all ultimately about looking for or to express the love that you already are. This module uncovers what True Love really is and how different that is from the concept society and most people have about love and what it means to be loving. This module goes even deeper and also shows you why love isn’t actually free, and why a lot of things that seem “loving” actually are just an agenda and why the most loving thing you can do is sometimes the complete opposite of how “human love” would act. What are reflections and why do they exist? This is the module that gives you the complete understanding of Reflections and why they are so important in helping you go deeper into Truth. You will uncover the 3 types of reflections, indirect, true and complete, the purpose they each serve and what they are actually reflecting back to you. You will also see the power in making decisions from what’s True (from what’s reflecting) rather than what’s being reflected and why it’s not necessary for everyone to “awaken”. What are thoughts? Where do your thoughts come from? And who is the one actually “thinking”? This thought-provoking module dissects all of this and more as it uncovers why we have thoughts and the purpose they serve. Are you even in control of what you think? This module begins to cover the journey leading you back to living your Truth in your external reality, but this time it’s a new you showing up. This module is all about bringing your internal and external worlds together as one and grasping the difference between putting “the power” into form versus “being the power” and using it “through” form. This module covers the idea of wealth and how we truly attain a wealthy life. It also uncovers the Truth about why people are not being wealthy. You will learn how it’s not money that we lack, rather it is Space. This module also covers all the common things people use to consume their space and how to make more space in your life again. The greater your space, the greater your ability to be wealthy. In many modules, it has been shared how “purpose is in who we are and not what we do” and ‘it’s when you’ve realised the purpose that’s in who you are, you then give purpose to what you do and not get purpose from what you do”. This module will leave your ego doing backflips and free your soul to soar a life that is not bound by meaning nor purpose, a life that has transcended the limitations that we give to form. In this profound module, you will capture the essence of true manifestations and why some of our manifestations are forceful where others need no force whatsoever. What’s the difference between having “willingness” and to have “will”? What’s the difference between motivation and inspiration? Grasp the roots of where these words are coming from and you can grasp “Free Will”. So much has been said about Space, now see how Time falls into the picture. What does it really mean to transcend time and space? And why is being in the “present moment” still being limited by time and the story? In this module you’ll reach and touch what it really means to be INFINITE. In this module we discover what it ultimately takes to be ONE with the Truth and how the previous modules fall perfectly into place upon the journey to Truth. Uncover the transition points from phase 1, phase 2 and phase 3 of consciousness. And finally, why some are ready for it, and others are not and what determines someones experience of the Truth. Who is the OMG Program for? I’d rather tell you who this program is not for because to be honest the individual this is for will already know it is for them. They will feel like it’s what they had been looking for all along. So, the individual this is not for is the person who is not ready for change and not up for being personally challenged. It’s not for the person who’s looking for a quick fix or a magic pill. It’s not for the individual who feels that information and this style of coaching that will help people should be free. It’s not for the person who is still looking for the “value” in spending money or time in experiencing who they Truly are. It’s not for the person who is not willing to be truly honest with themselves. At the start of each month you’ll receive 2-3 core content videos from Amir. These are 60-90 minute videos and cover the core teaching on the topic of the month. Every morning you will receive an email that includes something different to support you and is based around delivering bite-sized pieces of Amir’s coaching on the topic of the month. This could include; audio content, videos, guided processes, and exercises. Each day supports you to stay plugged in, to ensure you succeed at integrating all that Amir shares as this enables you to truly live it in your life. Each month you’ll have the option to attend two live coaching calls with Amir. This takes place online via our video platform Zoom. This is your chance to share your experience and ask questions directly to Amir. If you can’t attend live, you’ll have the opportunity to send him your questions in advance. Follow Amir on social media to be the first notified when enrollment becomes available.